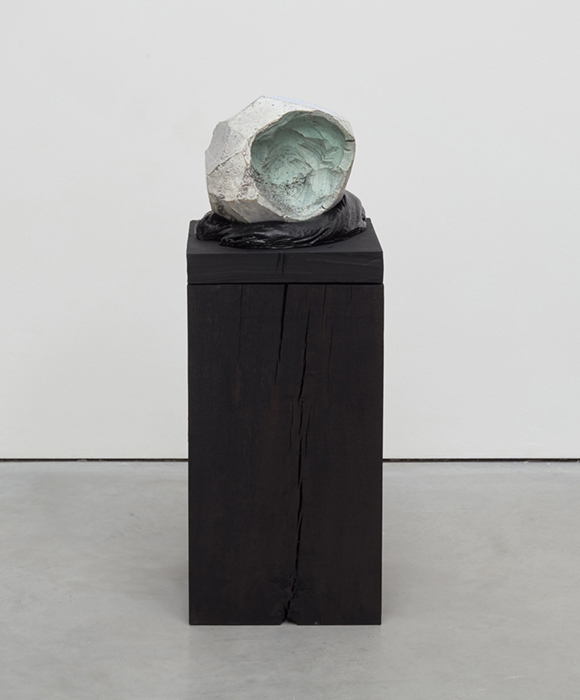 Eva Rothschild’s work exudes a singular presence, engaging with the history of modernist sculpture and natural phenomena interpreted through unexpected materials. Recognizable forms like columns and plinths are realized in stryrofoam, tile, or bronze, and geometry softens or splinters under closer inspection. The base of Sleeper is topped with a swirl of painted cloth that supports a geological formation resembling a geode that has been broken open. A mythical aura permeates the work, with Rothschild’s handmade surface imparting a strong physicality. Born in Dublin, Rothschild attended school in Northern Ireland and currently lives in London. She has had exhibitions at Tate, London; Douglas Hyde Gallery, Dublin; the Kunsthalle Zurich; and the Nasher Sculpture. Rothschild will represent Ireland at the 2019 Venice Biennale.